Walking, pub racing & plentiful barrels of beer! 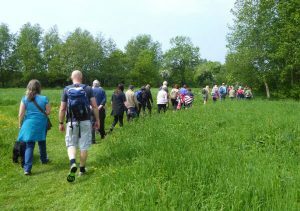 Whitchurch in Hampshire weekend’s celebrations began with their first Walkers are Welcome led Family Fun Ramble through the fields and water meadows of the River Test. 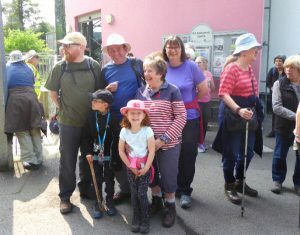 The sun shone brightly over Whitchurch as a large group of residents were joined by visitors from nearby towns and it was great to see three generations walking together in the spring sunshine, celebrating seven years of the Mill Trail. After a short stop at Bere Mill to watch the fly fishing, the group split with a number heading off down the trail to the Watership Down Inn’s ever popular Beer Festival with the rest of the group continuing back in to town for a very welcome lunch. The following day was given over to the legendary Pub Race…apparently there are a set of rules with prizes given at the end of the day for fastest team, best costumes & sober/still standing! 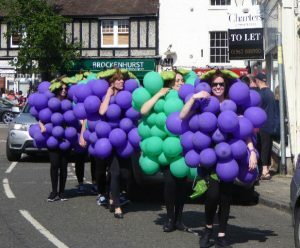 This year over 30 teams in full fancy dress ran, walked and staggered the hilly two mile route between Whitchurch’s various watering holes collecting donations for the town’s various good causes.